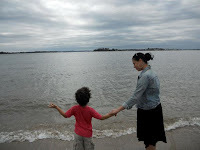 April is Autism Awareness month, but my six year old son has autism – I am always aware. Statistics state that 1 out of 125 children are diagnosed with autism. And I read somewhere that the average person has 227 Facebook friends. I’m no math genius, but I’m going to assume that based on those numbers – everyone should know someone with autism. And if everyone should know someone with autism - why am I still meeting people who don’t understand what autism is? Why do some adults or children stare at my son while in the playground? Why are people perplexed that my son has language, even though he has autism? Well, consider this is a crash course in what I’d like you to know about autism. If you are thinking Rain Man or Temple Grandin – you’re wrong. Yes, they are autistic, but they do not define autism. It’s extremely important to remember that autism is a spectrum. Some individuals have language, others do not. Some are extremely high functioning, while others are cognitively impaired. Ultimately it doesn’t matter where a person falls on the spectrum – they are all valuable members of society who deserve to be treated with respect. How do I explain autism to my typical children? Autism awareness needs to be taught at a very early age. Let your children know, it’s okay to be friends with someone who is different. My Friend with Autism by Beverly Bishop defines the common characteristics of autism in clear and simple language; and suggests how to help manage situations. For example: "Change is hard very hard for my friend. I try to help by telling him what is going to happen next." My friend’s child has been diagnosed with autism. What do I say? What do I do? This is a tough one. While there is no one right thing to say or do, I would advise NOT to say anything that sounds like “I’m sorry” or “God doesn’t give you anything you can’t handle”. Let your friend know that you are there for them. Listen to them. Let them cry if they need it. And when they laugh. Laugh with them. Because that’s what friends do. It’s not enough for those who know about autism to talk about autism. Autism Awareness is a two way street. It’s a conversation that needs to start at home with your children – whether or not autism impacts your life. A lot of time is spent teaching autistic children to pick up on "typical" social cues. Wouldn’t it be wonderful if typical kids were taught to understand the social cues of a child like mine? About the Author: Lisa Quinones-Fontanez is a legal secretary by day, MFA Creative Writing CCNY student/blogger by night and a mommy round the clock. Her blog AutismWonderland focuses on her family journey with autism and also provides local resources for children/families with special needs. In between work, school, blog writing and advocating for her son, Lisa is also working on a historical fiction novel (working title) A Thousand Branches. A chapter excerpt (The Last Time of Anything) from A Thousand Branches received Honorable Mention in Glimmertrain's Family Matters October 2010 competition. And sometimes, Lisa (@LaliQuin) Tweets and Pins but most of her social media time is spent on Facebook.